Modular construction, also termed accelerated construction, has been an alternative form of constructing permanent and relocatable buildings for over 40 years. Modular buildings generally consist of sections (modules) that are manufactured in a factory and then shipped to a build site with all interior plumbing, electric and fit outs completed. Once on site, the modules are assembled, additional architectural finishes may be applied and the finished product is, on the most part, indistinguishable from a site-built structure. Flexibility in an organization’s long term plans is one advantage to modular construction. Buildings can be added to or reduced in size by adding or removing modules. This can be done rather seamlessly without altering the basic construction of the building. Modular buildings can also undergo changes in functionality using the same process of adding or removing modular components. For example, an office building can be built for a company that plans to expand in the future. As the need arises to add more offices and conference areas, additional modules are shipped to the site and added to the existing building. Access points are created and the expansion becomes seamless with little interruption to the company’s operation. The same can be true for an organization that is downsizing. Modules can be removed, and if designed properly through forethought, can be sold off as a separate smaller building. By adding or removing modules or moving the building to another location and changing the architectural design, another user can change the functionality of a building, such as turning an office building into a retail center on the other side of town. The ease with which the modular construction process allows for flexible design and reuse strengthens its position as a resource efficient, inherently greener way to build. Renovated reuse can provide advantages in sustainability, cost savings and still be as architecturally alluring as builidngs constructed by more traditional methods. Because modular manufacturers buy in bulk and can be working on multiple projects simultaneously at the same “site” there is much greater efficiency in terms of materials usage. Again, manufacturers tend to buy material in bulk and save excess materials for the next project. Virtually, no waste is shipped to the site, and thus ends up in landfills. The strategy of ordering 5 percent to 10 percent extra material – common for on-site construction – is very uncommon in off-site facilities. On-site builders often have limited storage space at their construction sites, and do not always have an exact accounting of all necessary materials at the start of construction, leading to less efficient procurement. Construction of modular buildings generally occurs simultaneously with the site work so the traditional construction schedule is significantly compressed. This allows for most projects to be completed 30 percent to 50 percent sooner. The coordination of trades that occurs at the factory also improves efficiency. No longer do electricians and plumbers have to wait until the entire building is framed in to begin work. No longer does the first floor need to be completed before beginning on the second. The streamlined and efficient work process results in few labor hours needed per project and thus fewer trips to the site per project. Modular buildings have a wide variety of uses. They will either be used for long-term temporary or permanent facilities. Such uses include construction camps, laboratories, schools and classrooms, civilian and military housing needs, and industrial facilities. Modular buildings are a perfect solution in remote and rural areas where conventional construction may not be reasonable or even possible. Other uses have also been found for modular buildings including churches, health care facilities, sales and retail offices, fast food restaurants and Ticket Offices. Modular components are typically constructed within a large indoor facility on assembly lines. Such facilities use an assembly line track to move the modules from one workstation to the next. Independent building inspectors are on site to supervise the construction and ensure that all building codes are adhered to during assembly. The completion of the modules can take one to three months but often take as little as 10 days actually to construct when they are first started. They are then transported to the building site and assembled together. Sometimes a crane is brought in to set the modules and often they are just rolled on to the foundation with translifts, a piece of equipment with tracks that a building can actually be set on and moved a short distance. The placement of the modules together generally takes several hours or days. Once assembled, modular buildings are essentially indistinguishable from typical site-built construction. Historical evidence has shown that a well-built modular should have the same longevity as its site-built counterpart, increasing in value over time. Modular buildings are very affordable because of the factory construction of these buildings. These units are typically constructed in an enclosed facility; therefore weather is not a factor in the construction time line. Material delivery fees are also out of the equation because an ample amount of material will always be available at the facility, as opposed to being delivered in limited quantities to the job site, nearly eliminating construction delays, and theft of building materials from the site. Speed of Construction/Faster Return on Investment – modular construction allows for the building AND the site work to be completed simultaneously, reducing the overall completion schedule by as much as 50%. Indoor construction. Assembly is independent of weather which increases work efficiency and avoids damaged building material. Favorable pricing from suppliers. Large-scale manufacturers can effectively bargain with suppliers for discounts on materials. Ability to service remote locations. Particularly in countries throughout the globe there can be much higher costs to build a site-built structure in a remote area or an area experiencing a construction boom such as mining towns. Modular buildings can be built in major towns and sold to regional areas. Low waste. With the same plans being constantly built, the manufacturer has records of exactly what quantities of materials are needed for a given job. While waste from a site-built dwelling may typically fill several large dumpsters, construction of a modular dwelling generates much less waste. More environmentally friendly construction process – modular construction generates less materials waste and less site disturbances than comparable site built structures. Typically, modular dwellings are built to local, state or council code, so dwellings built in a given manufacturing facility will have differing construction standards depending on the final destination of the modules. Steel and/or wood framing are common options for building a modular building. Modular building designs can be customized for local zoning codes. For example, structures built for final assembly in a hurricane prone area can have additional bracing built-in to meet local building codes. 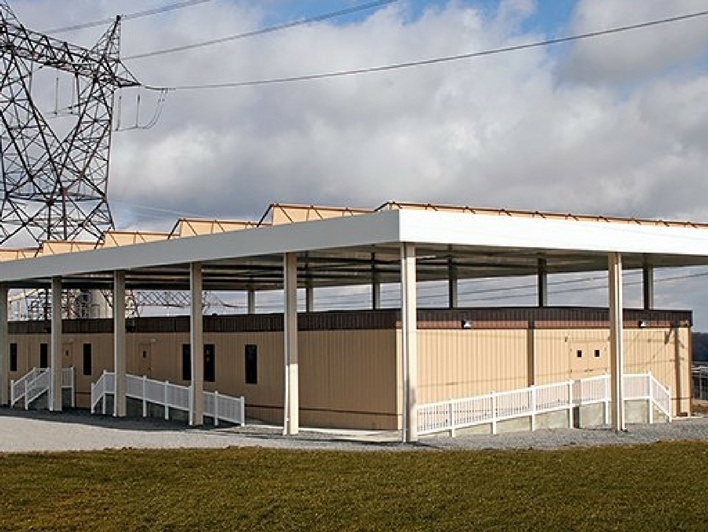 Modular buildings can be assembled on top of multiple foundation surfaces, such as a crawl space, stilts (for areas that are prone to flooding), full basements or standard slab at grade. They can also be built to multi-story heights. Barracks, dormitories, motels and other multi-level structures have been built using modular construction techniques. The height that a modular structure can be built to depends on jurisdiction but a number of countries, especially in Asia, allow them to be built to 24 floors and possibly even more. Exterior wall surfaces can be finalized in the plant production process or in the case of brick/stone veneers field applications may be the builder’s choice. Roof systems also can be a part of – separate from – or applied in the field after the basic installation is completed. According to manufacturers, modular buildings are generally designed to be initially stronger than traditional homes by, for example, replacing nails with screws and adding glue to joints. This is supposed to help the modules maintain their structural integrity as they are transported on trucks to the construction site. Despite manufacturer claims that the modular building is initially built to be stronger than a traditional building, it is difficult to predict the final building strength since it needs to endure transportation stresses that traditional homes never experience. The Modular Building Institute, an international group of businesses involved in different aspects of modular construction, believes it is not necessary for an entire project to be completed by a modular manufacturer. To capitalize on the advantages of modular construction, architects, general contractors and owners would be well advised to have conversations with modular manufacturers prior to a project to determine if certain components of the project lend themselves to off-site prefabrication and realize efficiencies immediately.